Loughborough, England - Saturday 31 July 2010: Australia win the open team world championship and Belgium win the mens team world chamption ship at the World Rope Skipping Championships are held at Loughborough University. 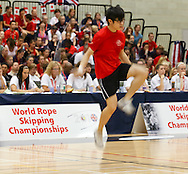 Involving competitors from as far afield as Hong Kong, Australia and the USA, the event was very well attended and showed off the very best skipping skills. If you want to buy any images for personal use, please make a note of the filename(s) and email andrew@slikimages.com.